You haven’t even had a chance to pick through you trick or treat loot (more likely recover from your Halloween hangover) and we’re already talking about New Years Eve weekend. Did you think that you could coast through the Thanksgiving food coma and just “go with the flow” until Christmas? No, no. You’ve got plans. We’ve made plans. Start dialing up your crew because this is New Years Eve weekend, you’re gonna let the bass rattle your bones into 2018. RPM Presents is bringing you the quintessential warehouse rave to jumpstart your 2018 celebrations. Co-headliners Zeds Dead and Jauz are teaming up for a rare brand collab with a Deadbeats Goes Off the Deep Endparty on Friday, December 29th. 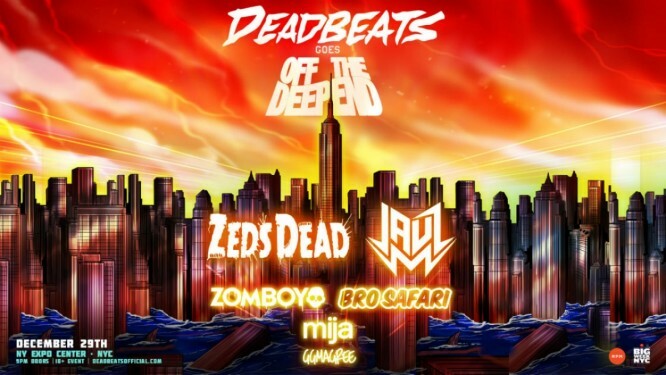 Held in the NY Expo Center in the Bronx, Deadbeats Goes Off the Deep End is channeling bass shaking beats with support from Zomboy, Bro Safari, Mija and more. This gargantuan industrial-sized park recently served as the playground for Elements Festival and The Greatest Day Ever, making it the new hotspot venue. Start training now, because this 4-day NYE weekend is not going to be for the faint of heart. It’s gonna take grit, mental toughness and a memorable crew to pull you through the weekend. We know you have it in you.